African-American authors rarely receive national recognition for their work. There are a few, like novelists Terry McMillan and Walter Mosley, whose profiles have been raised due to movie adaptations. And a few others, like NY Times reporter and Pulitzer Prize winner Isabel Wilkerson, experience national breakthroughs for historical or non-fiction work. But the most consistent, high-profile, annual recognition bestowed upon Black authors are the NAACP Image Awards nominations for outstanding literary work. I was fortunate to receive one such nomination this year for my recently released book, 101 Scholarship Applications: What It Takes to Obtain a Debt-Free College Education. This was not only my fifth published book, but it was a book that I originally had not intended to write. Its publication resulted from two years of research I conducted to ensure that our daughter, who is now a freshman at North Carolina Central University, had no college loan debt upon graduation. After receiving numerous inquiries from other parents, I felt the most efficient way to distribute the information was by compiling it in a book. In September of last year, I received an email from the Image Awards announcing that the nomination process for the literary awards had begun. As co-founder and national coordinator of the National Black Book Festival, I often receive these types of notifications, which I distribute to authors within our network. As I scanned the list of categories, I noticed one titled “Instructional,” and I decided to submit my book, which was released later that month. The Awards Committee requires applicants to submit 15 copies of their books for review, plus a processing fee of $215.00. The competition was tremendous, and there was no guarantee of success. Since my books are self-published, the fee and the cost of printing the books was an additional personal expense, but I decided to take a chance. As it turned out, it was the best $215.00 I’ve ever spent in terms of a return on my investment. When the nominations were announced in December, my book was among them. 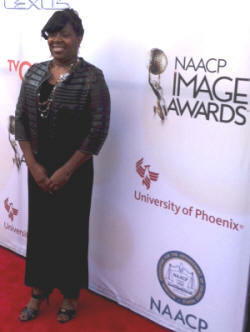 The NAACP Image Awards provides tickets to the festivities for all nominees and a guest, but they do not cover travel expenses. However, I viewed the nomination as a once-in-a-lifetime opportunity, and decided to make the trip to Los Angeles for the two-day affair on Feb. 5 and 6. The event did not disappoint and exceeded my expectations. Nominees were treated like winners throughout the Image Awards, receiving free access to the women’s brunch, two red carpet opportunities, non-televised awards on Thursday evening, televised awards on Friday, and the after party featuring Chaka Khan as the musical performer. The menus were first class with open bars throughout both days. The nominees hobnobbed with television and movie celebrities, who were, for the most part, accessible and friendly. Photographers from national and international publications took red-carpet photos of all nominees who attended. The literary awards were announced on Thursday evening and there were eight categories: Fiction, non-fiction, instructional, children’s, debut author, young adult/teens, biography, and poetry. To my surprise, there were only a few of the literary nominees in attendance, but the excitement was electric. Those who won (I was not among them) graced the stage with heartfelt acceptance speeches. Although the Image Awards celebrated its 46th anniversary this year, the literary honors were first launched 22 years ago in 1993, with only one category for outstanding literary work. Their expansion to eight separate categories, with five nominees for each, represents an opportunity for authors to receive honors for something many would do for free. Indeed, most writers pursue their craft for years without compensation. Writing is a passion which compels them, in hopes that the readers will either be entertained or informed. If not for the efforts of the NAACP Image Awards, African American authors would have few opportunities to receive national recognition for their literary works. With the thousands of books now published by Black authors every year, the Image Awards play a major role in maintaining the standards of excellence in African-American literature. Gwen Richardson is a Houston-based entrepreneur and author. Information about her and her books can be found on her website: www.gwenrichardson.com.